Smart PowerMarquee - Applying a Marquee Could Not be Simpler! Applying a Marquee could not be Simpler! Plant engineers, process engineers, quality engineers, and plant managers today, all want a plant wide visualization system that displays production data, reject data, uptime/downtime data, as well as messages that can be seen hundreds of feet away by all team members. Many plants hesitate to install marquees as the implementation of a marquee system can be cost prohibitive (Typical implementation cost including software is 2-3 times the hardware costs). Now, Uticor has introduced a Smart marquee called the PowerMarquee, which has revolutionized the application of marquees on the plant floor. Earlier it took a minimum of two man weeks of software time as well as change or addition of new hardware to implement a new marquee. Traditional marquee systems with implementation costs ranging from 2-3 times the hardware costs alone. Software development and PLC logic takes weeks. The New Smart Power Marquee can be implemented in just hours, saving you thousands of dollars. The Smart PowerMarquee from Uticor cuts down the implementation cost to hours instead of weeks. It has not only the smarts of a data acquisition system, it has even a built in PLC if needed. For those applications where a control network already exists, for example DH+, Remote I/O, Control Net, Profibus, CC Link, Ethernet IP, etc. all you have to do is to connect the marquee to the network. No change in ladder logic required, and no change in any hardware is needed. 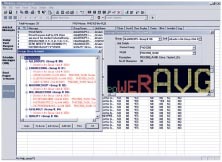 All you do is: program the PowerMarquee using our windows based editor, in minutes. 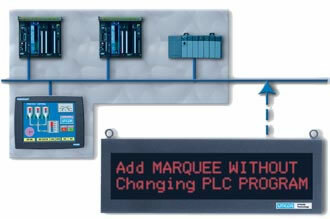 The PowerMarquee is capable of monitoring any tag/control variables/registers inside the control network on any PLC, and generating corresponding messages. In addition, it can collect data and analyze data. It has a powerful math engine that is capable of even calculating and displaying CpK values of a process. Proven to be two orders of magnitude easier and faster than any other marquee programming software available on the market today. Uticor is the leading supplier of rugged industrial marquees throughout the world. In fact it is the design and construction of our marquee that has earned Uticor the reputation of "Built like a tank" or "Uticor Tough", and allowed us to offer an unprecedented 4 yr warranty. Unlike some of our competition, Uticor marquees have 5x7 dot matrix characters instead of 5x5. For applications where it may not be convenient to access a PLC, the Smart PowerMarquee can utilize a 38 I/O built-in PLC to receive inputs from proximity sensors, limit switches, encoders, as well as temperature and pressure sensors, etc. In fact , The PowerMarquee has the brains of a TouchPLC built inside. For more information on the TouchPLC click here.